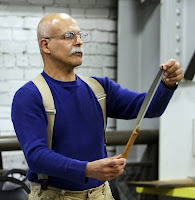 Alan Turner and Mario Rodriguez*, two well-known and talented woodworkers, were the guest speakers at our most recent woodworking club meeting, a combined meeting with another club. Alan started his own woodworking school several years ago, The Philadelphia Furniture Workshop, where both he and Mario are instructors. 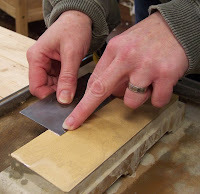 Mario demonstrated mitered through-dovetails and Alan demonstrated how to sharpen a scraper. Alan sharpens them a little differently than I do, so I decided to have a showdown between his technique and mine. I used the same scraper, a Sandvik, and sharpened one edge with my technique and the other edge with Alan's. 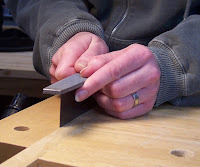 Chuck the scraper in a vise, and using a smooth file, square each edge 90º to the sides. Switching to an 8,000 grit waterstone, hone the edge. Skew the scraper as you hone, so you don't plow a groove in the waterstone. Next, hone 1/2" of the face of both flat sides. Put some oil on a burnisher (some people use the handle of a screwdriver, but I have better luck with a burnisher), hold the scraper in your hand** and, using a fair amount of downward pressure, slide the burnisher 3-5º along both sides of each long edge, 5 or 6 times. The idea is to create a hook on both sides of the ed ge so you can use both sides to scrape. First, he oiled the scraper and the burnisher. Then he laid the scraper flat on the workbench near the edge and used the burnisher to draw the metal out along each long edge on both sides of the scraper, creating a “U” shape of metal along each edge. Then he chucked the scraper in a vise and filed the edges to 90º. He added more oil to the scraper and burnisher, then he drew the metal out once more on the workbench. 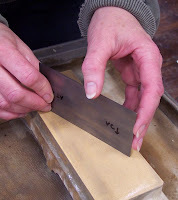 Back to the vise, he burnished each side of each long edge 2-5º. They looked the same to me. I was surprised because I thought Alan's would work much better. I still think his is a better sharpening technique that will produce more consistent results. But, take your pick! *Photos of Alan and Mario courtesy of Robert Aspey. 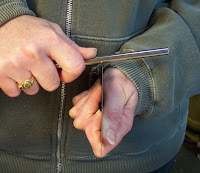 **It's possible to cut yourself by holding the scraper in your hand while using the burnisher, so to be totally safe, you can secure it in a vise instead. VC, You are so far beyond cool! You always bring some great learning experience into your blog! Great step-by-step intructions. I think my dogs can sharpen my scrapers now! Isn't that right, Shelby?! Great post VC! 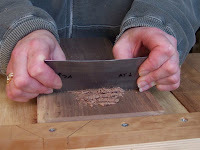 Scraper sharpening is an area where most woodworkers are looking for improvement - I know I am. Can't tell you how many times I've struggled on with a blunt scraper that is only producing dust because the job's almost done and I can't be bothered getting the waterstones out. My technique is quite similar to yours but perhaps with a greater angle on the burnisher. I'll try Alan's and see if it can be done as well with just file and burnisher. Was there any discussion of sharpening curved scrapers? Wish I could train my dogs to sharpen! Thanks for prompting a re-analysis. Say, you fellas may be onto something with teaching our dogs to sharpen. They already sweep up sawdust with their tails! Mark, I asked Alan about sharpening curved scrapers and he said that, rather than sharpen the entire curved scraper, just sharpen the section that you're planning to use. I'm going to try using a round file on the inside curves, because a flat file won't work, of course. For the outside curves, you can still use a flat file. The rest of his procedure should work fine. If you want to use waterstones, then I'd probably use slipstones for the inside curves. I've never actually used my curved scraper, so I'm not sure which technique works better. If you find out, please let me know! This, like all your posts, is extremely instructive. Do you have any advice for how to sharpen the scraper for a Cabinet Scraper? I have read conflicting information. Some say that you need to do it with a 45° angle, some say that you can use a normally sharpened scraper. From what I know of the angles which are required for planing, it seems to me like 45° is the right way to go, given the final angle of the burr produced, but I would love to hear from you if you have any tips or experience. Glenn, I own a Lee Valley Veritas cabinet scraper and have only used it twice, although it works superbly (like all LV tools, imho), so I have only minimal experience with one. I checked the manual that came with the scraper and LV recommends sharpening a 45º bevel, with final honing on a 4,000 grit stone; lapping the back; putting the blade in a vise and burnishing at that same angle 3 or 4 times; and then raising the burnisher's handle 15º and taking 3 or 4 more strokes to create the hook. That is the process for fine finishing. LV states that you can stop honing with an 800-1000 grit stone before burnishing, if you are using the cabinet scraper for general smoothing. Thanks a ton, that does help. I have been very hesitant to work with my cabinet scraper, though I was eager enough to buy it. Mostly, I just want to make sure that any frustration I have with the tool is really only coming from my inexperience with using it, and not from my lack of good preparation of the tool itself. Thanks again for the excellent info and help.